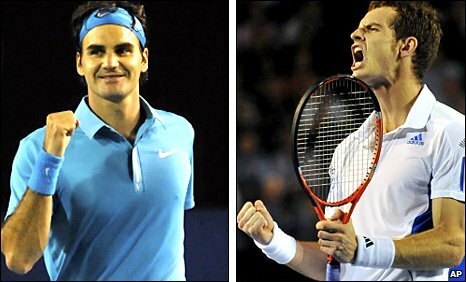 Roger Federer claims Andy Murray will be under "big pressure" in Sunday's Australian Open final. The 15-time Grand Slam winner thrashed Jo-Wilfried Tsonga on Friday to set up a mouthwatering final against British number one Murray. "I think he really needs it more than I do, so I think the pressure's big on him," said Federer, 28. "But we'll see how he's going to handle it. It's not going to be easy for him, that's for sure." Federer defeated Murray in the 2008 US Open final, the Scot's first Grand Slam final, but Murray leads their head-to-head 6-4. However, Federer believes his experience of 21 Grand Slam finals - and Murray's defeat in his first - could be crucial. 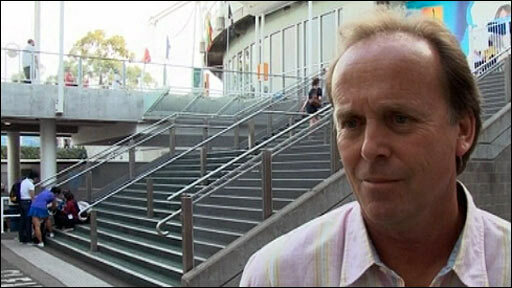 "Now that he didn't win the first one, I think doesn't help for the second one around," he said. "Plus he's playing me, who's won many Grand Slams prior to that, been able to win here three times so I know what it takes and how to do it, which is definitely an advantage." And Federer said Murray's winning record against him was easily explained. "First of all, he's a good player. I don't think otherwise you're just going to start having good records against me," said the 28-year-old. "But without taking anything away from him, I think a few times he played me I wasn't at my very, very best. "So I think the head-to-head could be quite different. That's why I don't really care too much about how the head-to-head stands. Every match is played differently. "Best-of-five set matches are very different anyway." Should Murray win on Sunday, he will also end Britain's 74-year wait for a male Grand Slam singles winner, a fact Federer was keen to highlight in his post-match interview when he joked about Britain's "150,000 year" drought. "I think he's done really well handling the pressure," said Federer later. "I think once your game is good enough, even on your off days to come through, I think that's what he's proving here at the Australian Open now. He's one match away. I'll make sure it won't happen. We'll see how it goes." Murray has dropped only one set en route to becoming Britain's first finalist in Melbourne since 1977, and that was against Marin Cilic in his semi-final win. Even before the second semi-final, the 22-year-old was confident he is ready to lift the trophy. "I want to be remembered for winning these things," the world number four told BBC 5 live. "I think [I can win it]. I've played my best tennis so far, I just need to do it in one more match. I'll give it my best shot. "There's a lot of pressure in Slam finals and if it's Roger, he's going to have the edge in experience. "But I feel like if I play my best like I have been this week and fight hard, I've definitely got a chance of winning." However, Murray knows he needs a "special performance" if he is to become only the third player (after Rafael Nadal and Juan Martin del Potro) to beat Federer in a Grand Slam final. 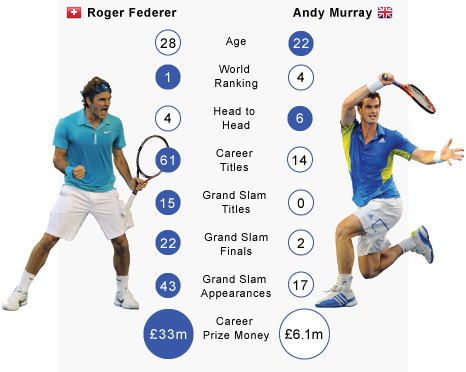 "Roger's record in Slams speaks for itself," said Murray. "He had a great year last year, making all four finals. The two that he lost were incredibly tough five-setters. "If I'm going to play against him, it will take a special performance to win against him, but I feel like I can do that." Murray is all too aware of Britain's long wait for a male Grand Slam singles champion, and he added: "I'd obviously love to do it. "I want to win it for the people that I work with, for my parents, who helped me when I was growing up, then doing it for British tennis and British sport would be excellent as well. "But the pressure that I feel doesn't come from the people that are around me. They obviously are happy with anything that I do." A sports psychologist told BBC Sport the key for Murray would not be avoiding nerves, but learning how to deal with them. "On his way to the start line before the Olympic final of the rowing, Matthew Pinsent said he just wanted the bus to crash. Neil Jenkins used to throw up before every rugby match," said Sarah Cecil, performance psychologist at the English Institute of Sport. 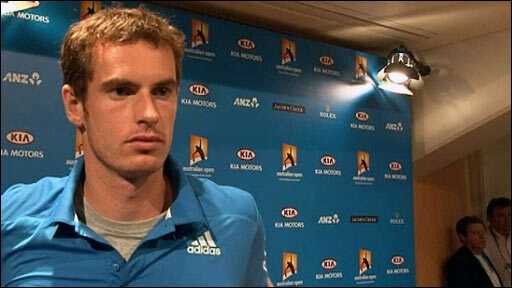 "Murray can't control it if he gets a rush of nerves but the key point is not stopping it but dealing with it. "He needs to keep his mind clear and not be too judgemental on himself." Among those supporting Murray at Sunday's final, which starts at 0830 GMT and will be broadcast live on BBC One from 0800 GMT, will be Murray's fellow Scot Sir Chris Hoy. The Olympic gold medal-winning cyclist is flying in from his training camp in Perth, while boxer Ricky Hatton, who watched Murray's win over Nadal, is also hoping to attend. Prime Minister Gordon Brown told BBC 5 live it would be "great news" if Murray were to triumph. "He's a great tennis player and a great guy," he added.